NEW DELHI, India (CNN) -- Pista Devi struggles to keep her toes from poking out through the holes in her shoes, as she pushes and pulls a wicked-looking farm tool. She is a widow, struggling to feed herself and five children. Pista Devi is struggling to feed herself and five children in a region with a rain deficit 85 percent below normal. She is bone thin but strong. She has to be. The soil is as hard as stone and as dry as the desert. Pista is trying to prepare the land for seeding. But her part of India is dealing with a rain deficit that is 85 percent below normal. "If the rains don't come then these fields will remain empty," Devi says. "No one will call us for work, and the children will have to go hungry. We won't have anything to eat." And India's economy relies heavily on agriculture. It accounts for about 17 percent of the gross domestic product. "We have always seen whenever something goes wrong with agriculture the entire economy goes topsy-turvy," Sharma says. But the government says there is still time for the monsoon to work its magic. "What I planted in the farms did not grow because of the dryness... ." farmer Vijay Pal Sharma says. He is worried about his family and his village where 90 percent of the 2,000 households farm the land. Eighty percent of India's farmers own very small plots of land, typically less than an acre. Not only do farmers get paid for their crops, but often their families live off what they grow. "There is so much poverty here," farmer Sharma says. "If the rains do not arrive, then people will die of hunger." It is a fear shared by his neighbors. In the scorching heat of the mid day sun, laborer Pista Devi has left the field. 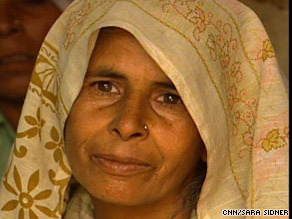 She sits on the floor of her home --- fashioned from cow dung --- and worries. She is troubled knowing she will not be the last in her family to rely on the whims of the weather. Her five children will too. "They will do the same work. They won't get a regular job. They are not educated. Without money I couldn't send them to school."